Rashomon began life as two short stories written by the great Japanese writer, Ryunosuke Akutagawa. It was famously adapted for the screen by Akira Kurosawa in 1950. In 1959, Fay and Michael Kanin adapted Rashomon for the stage, using many elements from the Kurosawa film that were not present in the short stories. The incidental music for Rashomon was composed by Laurence Rosenthal. Rosenthal, had written the dance music for the Broadway musicals The Music Man and Goldilocks, and the original score to Arthur Laurents’ play A Clearing In The Woods. He would go on to write several of the best film scores of the 1960s, including his classic music for A Raisin in the Sun, Requiem for a Heavyweight, The Miracle Worker, Hotel Paradiso, The Comedians, and Becket, the latter three films all directed by his Rashomon director, Peter Glenville. He also wrote the score for the Broadway musical Sherry!based on The Man Who Came to Dinner. The score is marvelous and very inventive, making use of certain traditional sounds of the Kabuki theatre and Oriental music, filtered through Rosenthal’s musical sensibilities. Arthur Miller’s Death of a Salesman opened on Broadway on February 10, 1949 at the Morosco Theatre. The result was an instant classic and it won many awards and a Pulitzer Prize. The incidental music for the play was written by Alex North. Director Elia Kazan asked North to write music for the play (he’d previously written the score for a documentary for Kazan). North soon went west to Hollywood, where he quickly became one of the greatest film composers in history, turning out brilliant scores to A Streetcar Named Desire, Viva Zapata(both for Kazan), and many others, including his all-time classic, Spartacus. Ironically, he’s probably best known for his song “Unchained Melody” (from the film Unchained) – that song, with lyrics by Hy Zaret, is one of the most recorded songs of the 20th century. 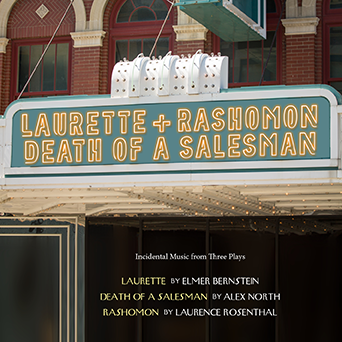 North’s incidental music for Death of a Salesman is classic North, scored for a very small ensemble that somehow never seems small, but just seems right. He would later use many of the themes in the film version, but there’s something about these lean and spare original versions that are haunting and wonderful. Kritzerland previously released all three of these scores – Laurette was coupled with a Bernstein film score called Prince Jack, while a separate release coupled Rashomon and Death of a Salesman together. For this release, we’ve put the three theater scores together and completely remastered them. Technology has come a long way since these were originally released on CD, so we asked Chris Malone, who is one of the best music restoration experts and who has saved many wonderful works from oblivion, to work his magic here. 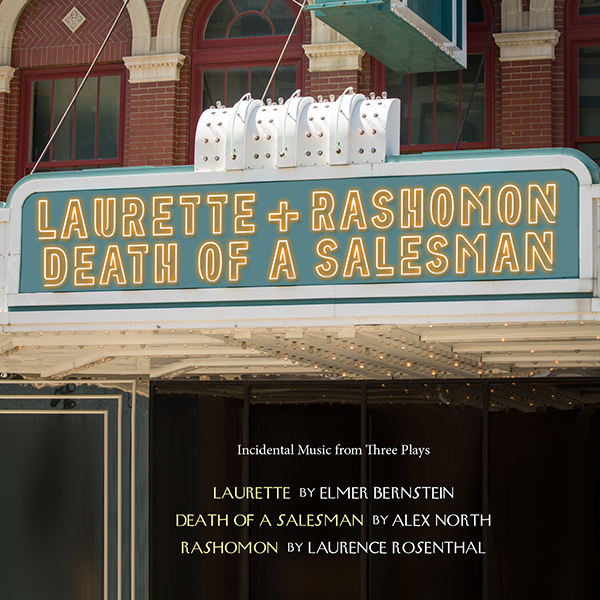 LAURETTE, RASHOMON, DEATH OF A SALESMAN – INCIDENTAL MUSIC FOR THREE PLAYS is limited to 500 copies only and priced at $19.98, plus shipping. This is a PRE-ORDER – CDs will ship by the second week of May, but never fear, we’ve actually been averaging three to five weeks early in terms of shipping ahead of the official ship date. THE AUDIO SAMPLES ARE NOT THE NEWLY-REMASTERED VERSIONS, WHICH ARE MUCH IMPROVED BUT WHICH WEREN'T QUITE READY FOR THE RELEASE ANNOUNCEMENT. THESE ARE JUST TO GIVE YOU AN IDEA OF THE WONDERFUL MUSIC.